The word "ruins" reminded me of broken houses or factories when I was in Japan. But in England the images of the word were quite different from those of Japan. I found the ruins of medieval castles and abbeys of England were very beautiful, tranquil and romantic places to remind me of many historic events, and I was fascinated by the ruins very much. The ruins of Kirkstall Abbey lie about 3 miles to the northwest of Leeds city centre. It was founded in 1152 by the Cistercians as a daughter house of Fountains Abbey, and was completed in 1182. Then it was dissolved in 1539 and became ruined. The abbey was granted to Thomas Cranmer, Archbishop of Canterbury in 1542, but in 1556, reverted to the Crown when he was burnt to death by Mary I for his religious beliefs of Protestant. 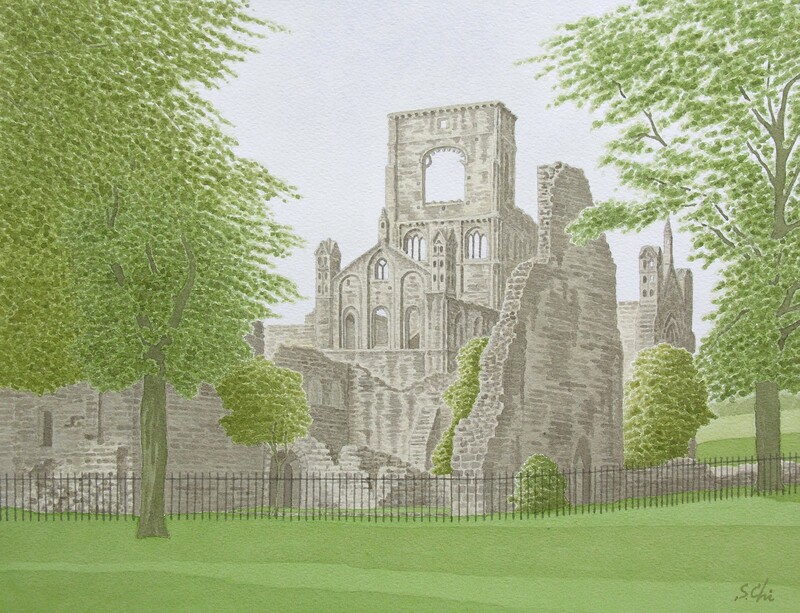 Kirkstall Abbey is said to be the finest early Cistercian house in austere Norman style in England. When I saw it, I was impressed by the soaring wall of a broken central tower at first. It is a really dramatic and fantastic scene which only ruins have. The abbey, originally constructed with yellowish grey sand stone, blackened over the years. The ruins suffered from the growth of Leeds as an industrial city long after the Dissolutions of the Monasteries, being exposed to the smoke from the factories. When the boom of ruins occured in the 1740s, as it was situated in the suburbs of Leeds, Kirkstall Abbey became a very popular picnic site for the citizens. Many poets and writers visited there and artists such as J. M. W. Tuner and Thomas Girtin painted the ruins in watercolours. I love Girtin's work entitled "Kirkstalkl Abbey"which was painted in 1802 from the eastern faraway place. The ruins which he painted were shinning white, reflecting the sunlight in the grandeur view of Airedale. It is the most famous picture by him and really one of the masterpieces of watercolours. I read that the economic activities of Kirkstall abbey, which were inherited by the ambitious new middle class after the Dissolutions of the Monasteries, had become the foundations of Leeds as an industrial city.